As with sports, sometimes the best trades are the ones you never complete. 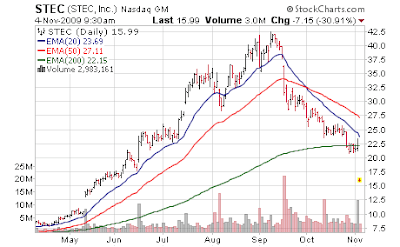 [Sep 22, 2009: Missed STEC Purchase by 23 Cents] Former momentum darling STEC (STEC) [July 16, 2009: STEC - Keeps on Tickin', Never Quittin'] is down 30% premarket despite good earnings this past quarter. The culprit is guidance due to an inventory issue with EMC (EMC). STEC's wonder product is the Zeus Solid State Hard Drive, and EMC is 90% of that business, so effectively STEC is joined at the hip with any EMC decision. This massive selloff does provide a compelling valuation; however the gap down today and residual fleeing of momentum lemmings is going to take time to resolve. The bigger question is how much time does STEC have before competition begins to crowd into the space, and start to compress financial metrics. In a larger macro picture it makes one wonder about the "technology is the one place company's are spending during the recession recovery" thesis. Flash memory storage products maker Stec Inc's (STEC) shares shed a third of their value after the company warned that a key customer, EMC Corp (EMC), would carry 2009 inventory into 2010, putting Stec's first quarters results at risk. The warning could indicate that the rate of replacing traditional hard drives with Stec's solid state drives (SSDs) in the enterprise storage and server market could be slower-than-anticipated. SSDs are viewed by many as the future of the disk drive industry as they are faster and, unlike hard disk drives, have no moving parts, making them sturdier. EMC, which accounts for 90 percent of Stec's Zeus IOPS SSD business, had placed a $120 million order for the second half of 2009, of which $55 million has been delivered, Chief Executive Manouch Moshayedi said on a conference call. The rest of the order is expected to be shipped in the current quarter, Moshayedi added. Zeus IOPS contributed $60.7 million to Stec's third quarter total revenue of $98.3 million. Third quarter profit rose to $24.5 million, or 47 cents a share, from $1.2 million, or 2 cents a share, a year ago. Excluding items, it earned 50 cents a share. Analysts were expecting earnings of 47 cents a share on revenue of $96.6 million. Gross margins rose to 49.7 percent from 32.1 percent. The company forecast fourth-quarter revenue of $101 million to $103 million, below analysts expectations of $106 million. Earnings excluding one-time items would range from 51 cents to 53 cents. "We were taken by surprise that (the inventory issue) occurred in the September quarter. We were expecting it in the March quarter," Capstone Investments analyst Jeffrey Schreiner said by phone. "We see the inventory adjustments impacting Stec beyond the first quarter of 2010," Schreiner said, adding that he expects overall demand for SSDs to pick-up again in the second and third quarters of 2010. That last comment is very interesting since analysts are already raising alarm flags about competition. Someone is distorting the truth. Seems like an overreaction but the type of "investor" in these type of high growth stocks does not allow for mistakes.